Every Thursday evening, Jazz and Sammie go to class together. Tess usually stays home with Jim. Yesterday, Jim was in Philadelphia for work, and since I didn't want to leave Tess at home all evening after being home all day while I was at work, she went to spend the evening with her "Uncle Jim." Tess got to go walking in the park with Jim, and since we take my car to class, she got to ride in Jim's van in Rocky's special seat, wearing Rocky's seatbelt harness! I'm sure Tess just loved sitting in the passenger seat facing forward to look out the windshield. She usually rides in the back of my car with a view only of where we've been, not where we're going! I'm not sure how Rocky's going to feel once he realizes that a silly spotted girl was riding in HIS seat and wearing HIS harness. Rocky is 14 years old, and while his trips to the park to walk may be over, he is still about the coolest dog in the world, which is why I nicknamed him John Wayne! He is wonderfully calm and confident, and both my girls are very respectful of Rocky. Thanks, buddy, for allowing Tess to ride in your seat and spend the evening with your Dad at the park. Thanks, too, to Uncle Jim for taking Tess to the park so she didn't have to spend the evening home alone! Tess - MX! ** Jazz - NAJ! 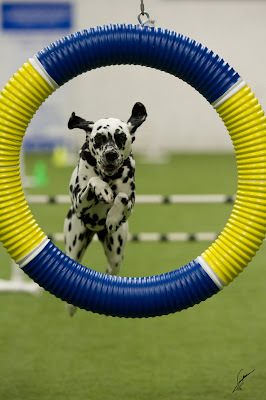 We had a wonderful titling weekend at the Westmoreland County Obedience Training Club agility trial! On Saturday, Tess started out with a 4th place Q in FAST. 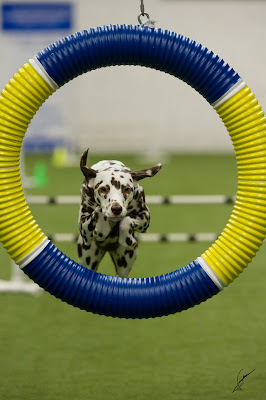 Then she went on to qualify in Excellent B Standard to earn her Master Agility Excellent (MX) title!! Woo-hoo, Tess! After working so hard to earn that MX title, Tess took a well-deserved mental vacation and didn't qualify the rest of the weekend. She needs two more legs for her MXJ title, so we're hopeful that she'll finish that before the end of the year. Jazz had a great weekend, too. On Saturday, she qualified in Novice FAST and got a 1st place qualifying score in Novice JWW! Then on Sunday, she got a 3rd place Q in Novice FAST. Today, she got another 1st place Q in Novice JWW, earning her Novice Agility Jumpers title with three 1st place legs! Jazz also got a 1st place Q in Novice Standard today, with just one more leg to go for her NA title. Not bad for a baby dog!! Of course, the girls had a fun time visiting with all their friends this weekend. A few of our buddies have puppies, and both Tess and Jazz enjoyed a little puppy play time, especially with Katie, our friend Linda's adorable little Cocker Spaniel pup. While we're sorry to see summer go, we had an enjoyable Labor Day weekend at the trial.